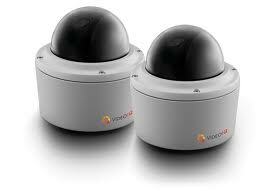 VideoIQ have come up with a fantastic IP network camera and an excellent solution for recording IP video. The iCVR IP network camera is armed with an on-board recording facility that lets the camera itself record on the edge of the network this serves the purpose of eliminating the need for an NVR or video management software. The IP network camera itself holds all the intelligence and by using on board analytics this IP network camera can both produce and record High definition images and can store these until called upon, meaning the network is left to simply retrieve images when the need arises, as a result bandwidth use is reduced to the absolute minimum. With the need for a central storage solution eliminated and advanced analytics that are able to learn events and increase accuracy over time, the video IQ IP network camera simple to both install and operate. It would seem that recording on the edge of the network is the way forward and Video IQ are well ahead of the game. This entry was posted on Tuesday, June 14th, 2011 at 20:08	and is filed under IP network camera. You can follow any responses to this entry through the RSS 2.0 feed. You can leave a response, or trackback from your own site.